It has been so busy for us here in the Rescue department that we have not had time to write about this story. 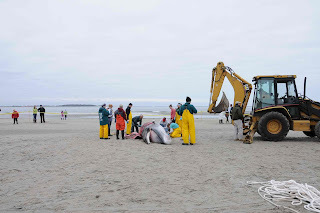 As many of you saw on the news, we recently responded to a dead minke whale on the north shore of Massachusetts. 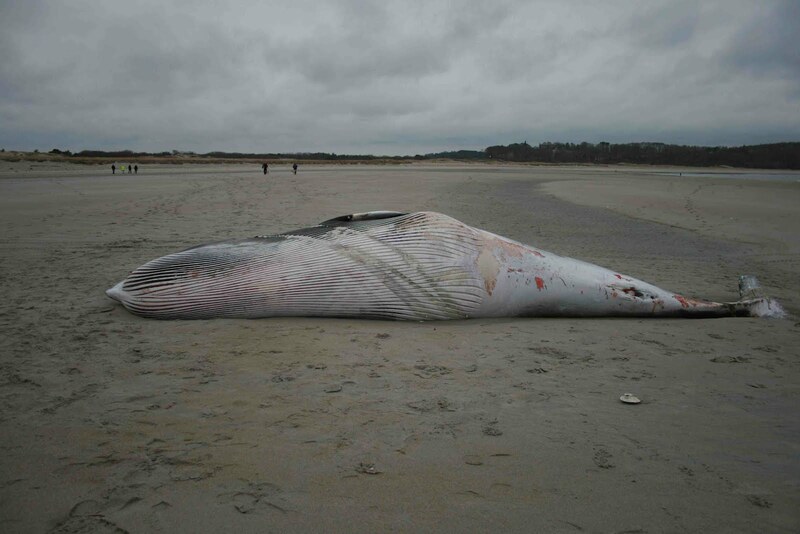 The whale stranded on Crane Beach, which is managed by the Trustees of Reservations. 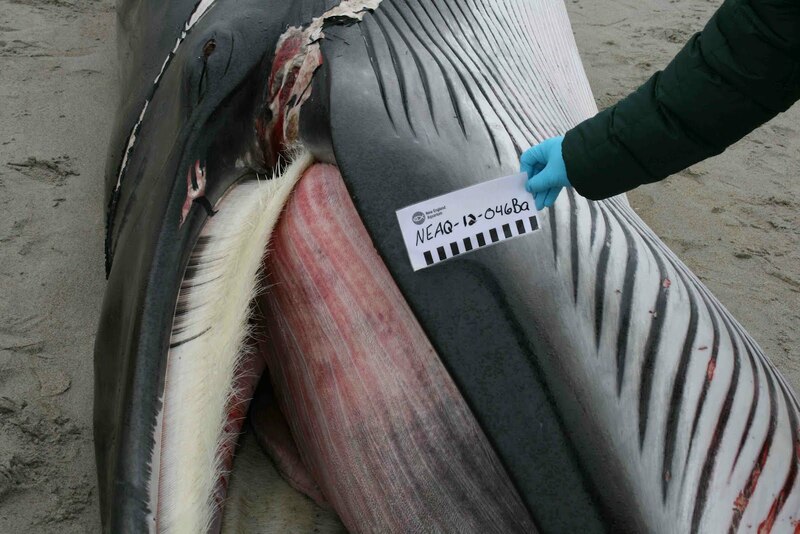 We began working with the Trustee staff at the reservation to establish a necropsy (animal autopsy) plan for this whale. There are a lot of logistics that must be worked out before a necropsy can take place. The Trustee staff determined that it would be possible to bury the carcass on their property; that set the stage for a necropsy exam. The first step when a large whale strands on the beach is to dispatch a team to the site as quickly as possible. This team will perform an external exam and collect life history information. In this case staff members Kerry and Ulrika took a team to the whale and worked with the Trustees staff to collect the data, photo document the whale and secure it for a the necropsy exam. 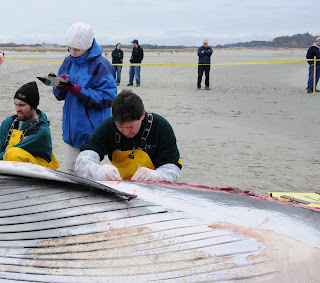 The photo below shows the team photographing the mouth area on this whale. This is a great photo of the baleen. The necropsy team includes a necropsy team leader, a site coordinator, safety officer, a photographer, a scribe, a team of cutters, a team of runners and a team in charge of sampling. There are many other roles but these are the most important. In the photo below, the necropsy team begins the dissection. The heavy machinery is used to remove and bury blubber and other parts after the team has examined them. In this photo Dr. Charles Innis, the Aquarium's chief veterinarian, examines tissue and collects a sample from the whale. Over his shoulder is the scribe who records information in real time. Collecting samples for histological evaluation is of great importance as it will help us determine the cause of death. 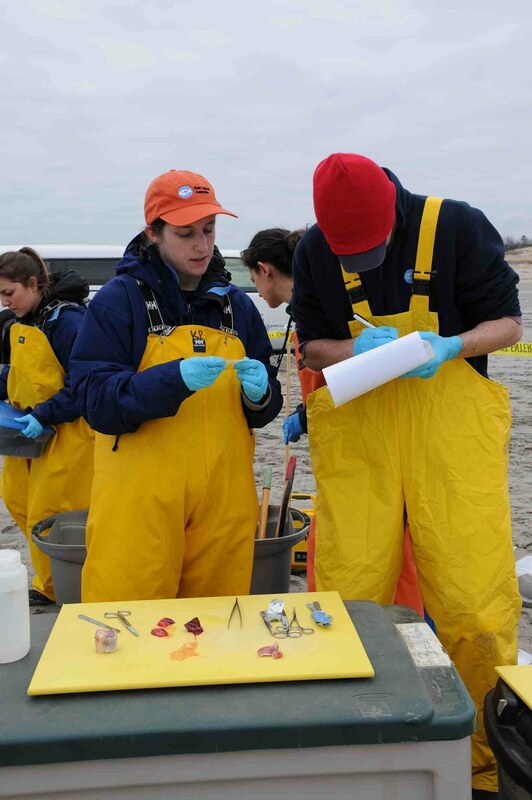 We have a trained sampling team who records and tracks each tissue as it is collected and preserved. In the photo below, Aquarium biologists Kerry and Eric record each tissue as it is collected. Large whales tend to be pretty obvious on the beach so in preparation for large crowds that tend to gather to watch the necropsy we brought three of our Aquarium educators. These folks educated the public on Minke whales and on the necropsy process. In the photo below Aquarium Educator, Kara Mahoney Robinson, shows two onlookers a piece of baleen from our collection. We would not have been able to investigate the death of this whale if not for the help and cooperation from the Trustees of Reservations on Crane Beach. Their role was crucial and their help and expertise with heavy machinery made this necropsy possible. In the photo below Arthur Howe (Art), the Public Safety Manager for Crane Beach, checks his radio. Art, and the other staff from the Trustees of Reservations were truly great to work with. In the background of this photo you can see other Trustee employees managing the soft tissue from the whale. What would a day conducting a large whale necropsy on the beach be like without getting our truck stuck in the sand? We don't know! 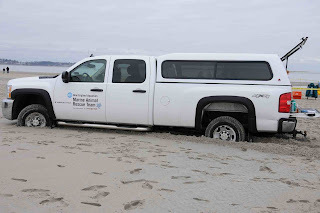 The great Trustee staff helped pull us out with one of the machines, otherwise the tide would have claimed out truck - YIKES! It will take several weeks for all the test results to come back. Once we receive the pathology report and other test results, our chief veterinarian will review these reports and other data to determine a cause of death. Thanks to all our staff, volunteers and colleagues who helped with this necropsy. 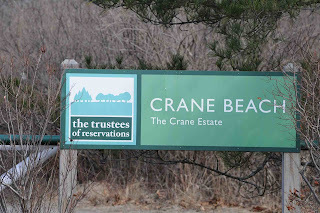 A special thanks goes to the Trustees of Reservations on Crane Beach for all their help and support. 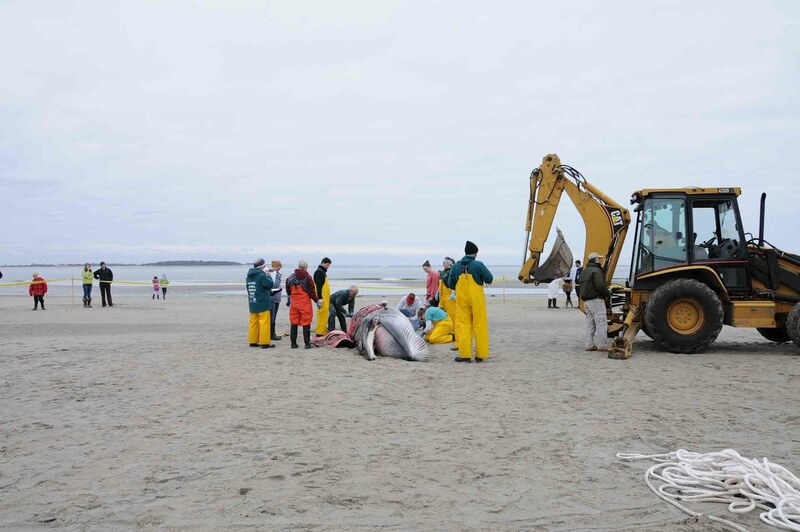 Just when we thought we were in the clear, the dolphin strandings on Cape Cod began to pick up again this past week. Being the friendly neighbors that we are, the Aquarium Rescue team loaded up our vehicle and responded three consecutive days to help out IFAW, the stranding response team on Cape Cod. 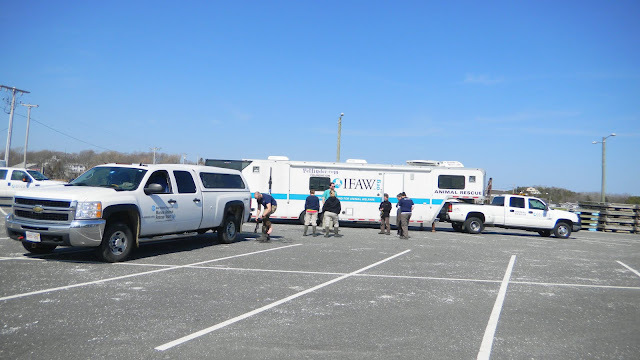 Animal rescuers and their vehicles gathered to coordinate responses. 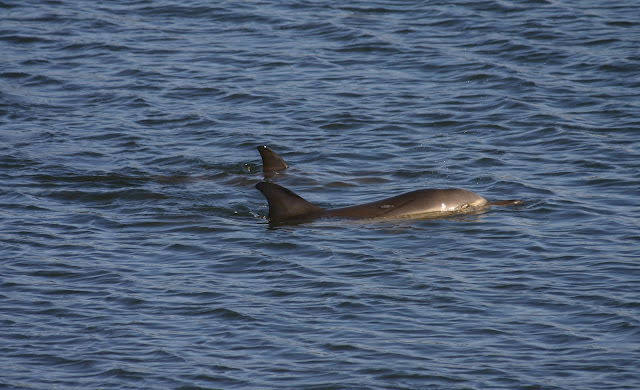 On day one, IFAW was able to successfully herd 9 animals out of Wellfleet harbor using their inflatable boat while NEAq kept a sharp lookout in other areas for dolphins in the shallows. Luckily, no other animals were sighted that day. 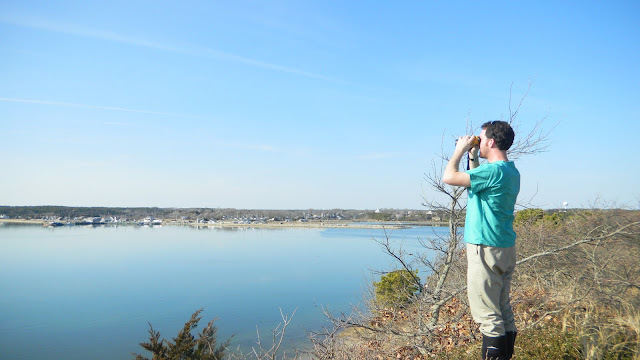 Volunteer Casey Fredette scans the horizon looking for signs of live dolphins in Wellfleet harbor. Day two started with two common dolphins just inside Wellfleet harbor. The Aquarium was on scene bright and early and got right into the action. Terry Rogers, an experienced field volunteer, was on site and was able to capture the image below. 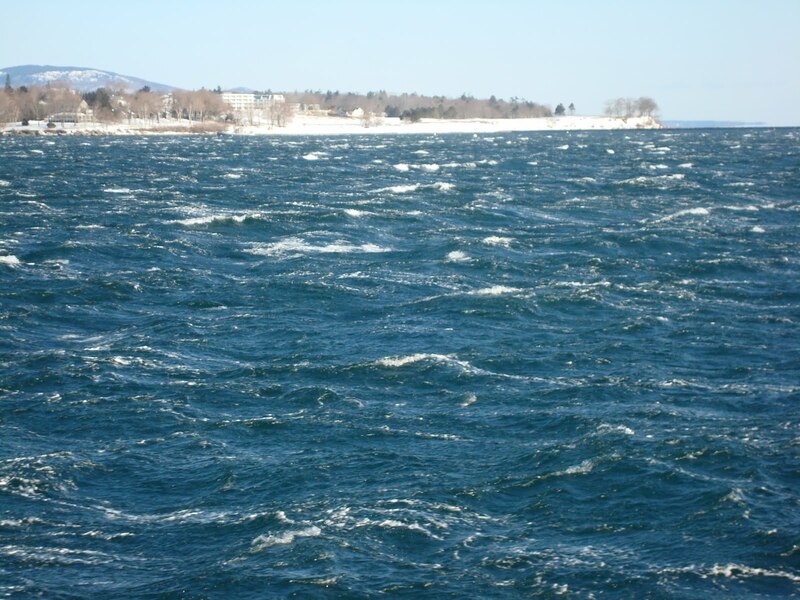 While IFAW began to organize herding efforts, the Aquarium team headed off to other areas to try and spot additional live dolphins in the area. 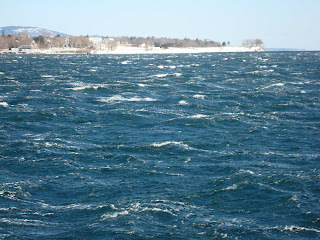 The conditions that day were quite blustery, and the swells and whitecaps made spotting live animals very difficult. Inside the harbor, the two live dolphins were not responding to the herding efforts and shortly after, the decision was made to collect the two from the water and attempt a transport. Unfortunately, one of the animals was worse off than the other and expired within minutes after being collected from the water. 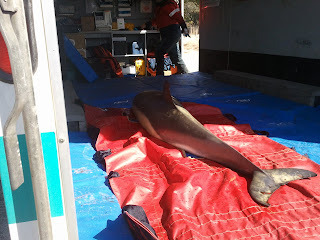 Our efforts were quickly focused on the remaining live dolphin and using a stretcher, it was loaded into the IFAW trailer for further health assessment and transport. 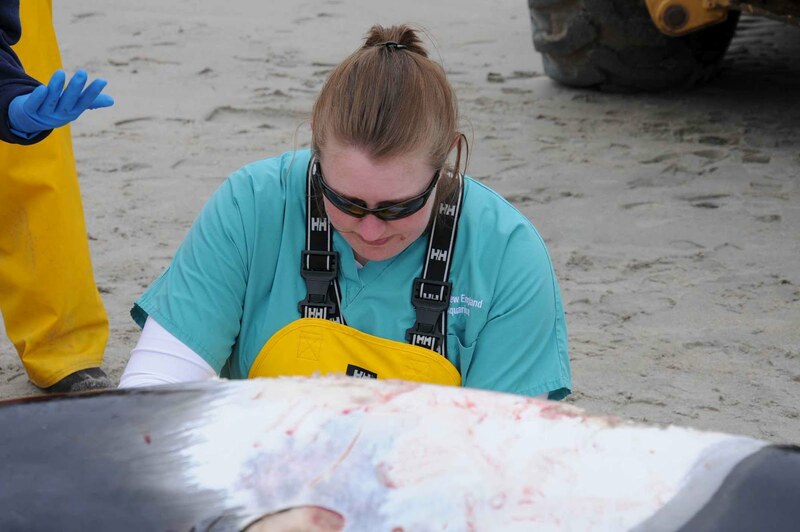 After collecting blood samples, and running further diagnostics, the animal was deemed fit for release and a satellite tag was applied to the dorsal fin. 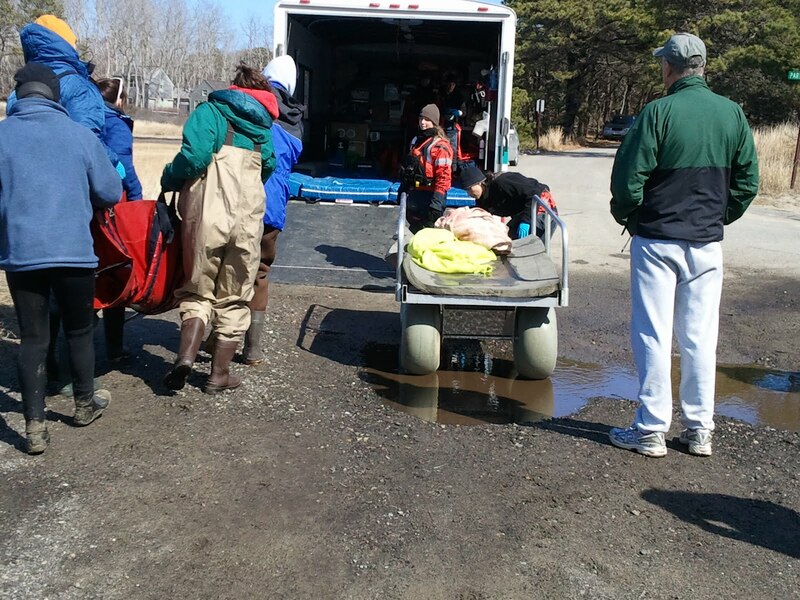 The animal was then transported and released from Head of the Meadow Beach, part of the Cape Cod National Seashore. The following day, the satellite track showed that the dolphin had moved a good distance off shore and was showing promising movements! It proved to be a long day, but successfully releasing that animal more than rewarded our efforts. Overall it was a great day, and a great experience! Fortunately, our third day of response was much more relaxing. The sun was shining, and it was a beautiful day with calm waters, perfect for spotting live marine life! 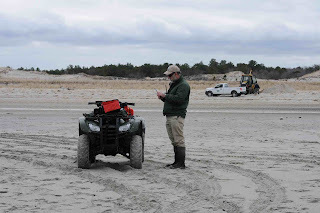 The Aquarium team spent the majority of the day checking areas around Wellfleet harbor and revisited Lieutenant Island. If you remember from Kerry's last post, Lieutenant Island can be a tricky location, and if you don't keep an eye on the incoming tide, you are stuck! We made it off the island in time, but some of us managed to take a bit of the ocean with us! Aquarium volunteer Kat Destefano empties her boot after just making it off Lieutenant Island. Its been a few days since our last response and things have settled down a bit. There have been no new reports of live dolphins in the area so we're taking some time to regroup and get some needed rest. Thanks to everyone who helped out responding those days and for putting in some long days. With out the help of the volunteers, these efforts just wouldn't be possible so hats off to you all! 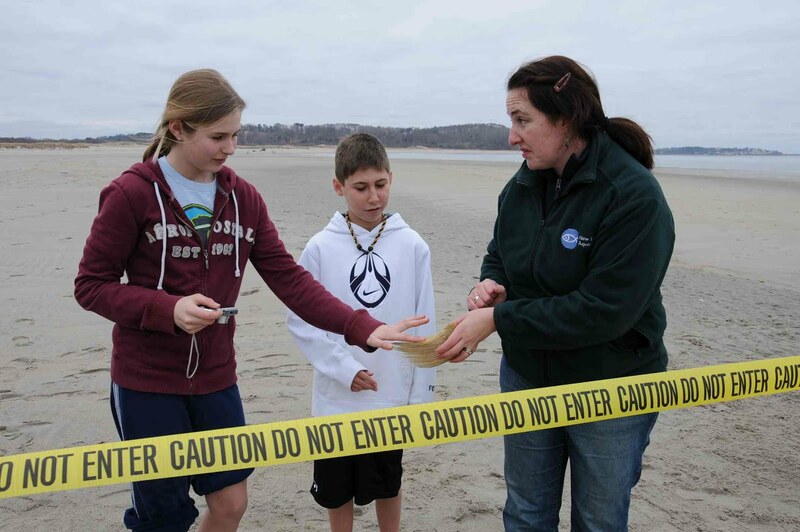 It's been a tiring and trying year for dolphin strandings on Cape Cod. Catch on Aquarium efforts to assist in dolphin rescues in previous posts here.